BETTY CASEY, formerly a ballroom dancing instructor, saw her first square dancing at the Cowboys' Christmas Ball in Anson, Texas. She got the bug while researching the dance so her Girl Scout troop could earn a folk dance badge. Among the first women callers in Texas, she studied under Dr. Lloyd Pappy Shaw and Francisca Aquino and introduced square dancing to Marshall Flippo, America's foremost national caller. Hundreds of students of all ages attended her school in Abilene, Texas. She taught square dancing and studied foreign folk dancing in Asia, Europe, and Africa. She participated in folk dance cultural programs from Tangier to Hong Kong and from Manila to Munich for the U.S.O., Military Special Services, North Atlantic Girl Scout Council, Brussels World Fair, embassies and consulates, U. S. Information Services, television and movies. 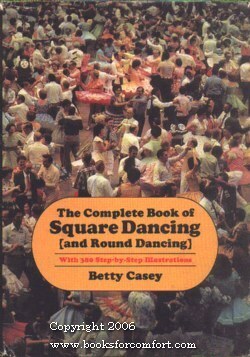 Betty called for square dancing at the Brussels World's Fair and the 2nd Asian Games, and her dancers appeared on TV programs and in movies.